The Sun transits your 6th House of work, health, personal wellness and how you earn a living, Scorpio. In April, there is good news for Scorpio. On April 4th, Mercury (Communications) turns direct and the miscommunication of the past few weeks finally dissipates. The focus will lean towards how you take care of yourself (mind, body and spirit), your daily work will seem more consuming than normal and there is also an emphasis on being of service to your community in some way, Scorpio. Mercury is a personal planet and represents the 3rd House of communications for Scorpio. Once Mercury goes direct on April 4th, you can move forward with any and all of your plans, Scorpio. The love planet (Venus) enters the sign of Gemini and your 8th House on April 3rd and will stay in your 8th House until August 7th, 2012. During the Venus transit, the stage is set for a memorable time in your love life and brings new potential partners interested in you, personally and professionally, Scorpio. Coupled Scorpios need a mini vacation since communication levels need to be restored somehow and some way. 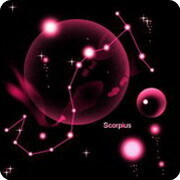 This transit finds Scorpio in an impatient mood and this could apply to your current marital status - if single. Steer clear of restlessness and an ability to lose interest in partners quickly. You need to focus more on pushing through your daily routines with courage, gratitude (for being employed in the first place) and bring excitement combined with passion to your daily life. You must emphasize quality in all that you do professionally this month. A Full Moon occurs in your 12th House on April 6th, Scorpio. This can be a comforting Moon or it can be VERY uncomfortable. It all depends on your attitude, outlook and tolerance. Anything is possible for Scorpio on this Full Moon. Avoid a tendency to isolate and reach out to others if you feel sad, Scorpio. It's also a great day to focus on something creative. Put forth your feelings into music, writing, art, whatever you passion may be. Remember that "Attitude determines everything". On April 10th, Pluto turns retrograde in your 3rd House of communications, relatives, neighbors and short trips. Somehow these areas tend to make you look inward or internalize your feelings. Pluto will remain retrograde until September 17th, 2012, and Scorpio, more so than any other sign, knows how to understand, cope and deal with this planets forcefulness. Single Scorpios might meet someone special unexpectedly in his or her neighborhood or through a family member and your communication styles could be extremely compatible, especially with Venus in Gemini. Coupled Scorpios need a change of scenery and MUST put forth every effort to do so. New experiences and new travels will keep the spark alive. Try to come from an understanding perspective if coupled, Scorpio. There is a need to refrain from saying things in the heat of the moment. Hold your fire, Scorpio. Imagine how much happier you will be when you have that special someone to hold at night. A New Moon occurs on April 21st in the sign of Taurus and your 7th House of marriage, divorce and those who might oppose you or try to. You gain a clearer perspective regarding the big picture of your life on this date. Circle this date as one that you might remember fondly in the future. There could be legalities involved and the promise of a friendlier future, personally and professionally. Make certain not to appear overly confident and try not to exert yourself physically on this date. You might feel edgy, achy and tired. Focus on the bigger picture which is the promise of more work and personal opportunities for more fun and laughter. A Cancer and a Capricorn could assist you in creative ventures and more this month, Scorpio.